The MOOC Revolution: True or Deja Vu? The stage appears to be set for what could be the future of higher education. 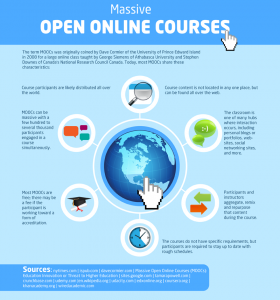 Massive Open Online Courses (MOOCs) are one of the hot topics for universities around the country, with hundreds of courses being offered worldwide at no cost to users. Some have said that this move towards online higher education is a revolution. Is this true…or is it deja vu? 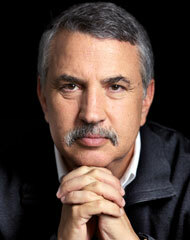 Thomas L. Friedman, an op-ed columnist for the New York Times, wrote an essay on March 5, 2013 titled “The Professors’ Big Stage”. In it, Friedman expressed his belief that MOOCS and online learning will have a huge impact not only in the United States, but also globally. He opens by telling a convincing story about his friend Michael Sandel, a Harvard professor, who has gained attention worldwide as a result of his new online “Justice” course. Having become a celebrity in both Korea and China, Friedman states that he has received popularity “usually reserved for Hollywood movie stars and N.B.A. players.” Friedman uses this illustration to convey the magnitude of the situation. He believes that “the MOOCs revolution, which will go through many growing pains, is here and is real.” Using information that he gained from a recent conference organized by MIT and Harvard, Friedman goes on to discuss the changes in education. He describes how there is beginning to be a shift where there is “less interest in how you acquired the competency … and more demand to prove that you mastered the competency.” Friedman believes that this trend will create the necessity for colleges to not only offer online courses by themselves, but also to make them an integral part of regular classroom learning. He thinks that regular note-taking learning environments will increasingly be removed in favor of online courses or supplements, and that soon classrooms will only be a place where “knowledge can be honed through lab experiments and discussions with the professor.” In order to keep jobs, professors will also have to improve their teaching skills and ability to talk with students, or fear that they will be replaced by better instructors online. While Friedman does acknowledge that there is “still” value in traditional classrooms, he warns that universities will need to blend technology into their education if they want to thrive. It is undeniable that MOOCs are becoming more popular and widespread, but questions about their effectiveness are also intensifying. While many people would agree that incorporating technology into a classroom setting could be useful, the success of having online courses stand alone remains to be seen. The prospect of cheap yet high quality learning is indeed one that is worth getting excited about, but perhaps should first be met with a healthy dose of skepticism…or history. Learning from previous examples, such as the radio ‘open air’ courses, provide an important way to avoid making similar mistakes in the future. Although viewed as a failure, acknowledging their existence does show at least that people have long yearned for massive open education. Perhaps now, that reality is not far away. This post is part of a series on “Making History Online” that involves an examination of open online learning. Students and faculty at the House Divided Project at Dickinson College are collaborating this summer on a new open, online course called, “Understanding Lincoln,” taught by Prof. Matthew Pinsker and covering ways to teach Abraham Lincoln’s legacy using close readings of his most important writings. This new type of online course represents a unique partnership between Dickinson College and the Gilder Lehrman Institute of American History. The course is available for both graduate credit and free participation. Registration for the course closes on Friday, July 19, 2013. For more information, go to https://www.gilderlehrman.org/programs-exhibitions/understanding-lincoln-graduate-course. As a college student, I have always been both curious and skeptical about “online courses”. Although I have never taken one, I have often imagined the potential ease that learning at home would bring. Is this concept too good to be true though? Surely there must be a catch. As an intern at Dickinson College with Professor Pinsker (who is preparing to launch a new online course of his own titled, “Understanding Lincoln”) I have had the opportunity to do some additional research on this topic. What I have found so far, is a range of opinions that seem to only highlight my own mixed thoughts. In response, I will be writing a series of blog posts on the subject, comparing and contrasting some of the main points of these articles while bringing to light both the potential benefits and risks of online courses. In an editorial for The New York Times Opinion Page, concerns for online learning and cautionary advice were deeply expressed. The article titled “The Trouble With Online College” from February 18, 2013, highlights the students rather than focusing on the professors and course itself. It uses recent studies to explain that the attrition rates for online courses are high, sometimes close to 90%. More specifically, The New York Times believes that the students damaged most are those who are vulnerable. The article classifies this group of people as those often barely prepared for a college setting, potentially having needs for more basic math and english classes, and often attending community colleges. It states, “A five-year study, issued in 2011, tracked 51,000 students enrolled in Washington State community and technical colleges. It found that those who took higher proportions of online courses were less likely to earn degrees or transfer to four-year colleges.” As a result, it proposes that these types of students should demonstrate their ability to learn first in a classroom, saying “Lacking confidence as well as competence, these students need engagement with their teachers to feel comfortable and to succeed. What they often get online is estrangement from the instructor who rarely can get to know them directly.” This concern is too big for The New York Times to ignore, and their article encourages universities to either improve online courses before opening them on a wide scale, or providing a hybrid option, which has proved to be more effective. Taking a much different approach than The New York Times, is Steve Kolowich, a writer for The Chronicle of Higher Education. In his article titled “The Professors Who Make the MOOCS” from March 20, 2013, he gives recent and compelling evidence in favor of online learning, Kolowich broadly reviews the responses of the largest ever survey of online course instructors. The result, is an overwhelmingly positive portrayal. Massive Open Online Courses (MOOCS) are the main focus of Kolowich’s article, in which he uses numerous generalizations from the statistics (103 responses) and personal statements from the professors themselves, in order to show their potential. Over 50% of the instructors, he says, believe that the online classes are as rigorous as classroom instruction, and many universities are now giving certificates for their completion. While most colleges do not offer these classes for credit, many believe that it is only a matter of time. 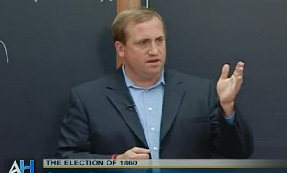 Kolowich notes that, “The American Council on Education, a group that advises college presidents on policy, recently endorsed five MOOCs from Coursera for credit, and it is reviewing three from Udacity.” Although a wide variety of schools have adopted variations of online learning, the professors who are at the forefront of these massive online courses are from prestigious universities such as Harvard, MIT, and Duke. Despite many of them originally being skeptical of these courses, Kolowich says, “Now these high-profile professors, who make up most of the survey participants, are signaling a change of heart that could indicate a bigger shake-up in the higher-education landscape.” Two-thirds of the professors surveyed see MOOCS as potentially lowering the costs of earning a degree from their home institutions, and possibly making college less expensive in general. Kolowich goes on to discuss that while the time and effort for creating these courses is excessive, most professors list altruism, increased visibility, greater reach, and staying in the forefront as worthwhile reasons for adopting them. While some critics say that online learning decreases the need for classroom learning, Kolowich makes it clear that many professors in his survey see it instead as a way to help improve classroom education. He states that “A key way professors are learning new teaching tricks is by taking cues from their MOOC students. Coursera, edX, and Udacity all track the interactions each student has with the course materials, and with one another, within a given course. Each platform then gives professors the ability to see data that could tell them, for example, which methods and materials help students learn and which ones they find extraneous or boring.” This outlook expands on the possibilities and potential of online courses by viewing them not only as a course itself, but also as a learning device for teachers. Despite such contrasting articles, one thing remains clear: online courses are racing to the forefront of education, and cannot be ignored. Kolowich, while focusing mainly on professors, portrays online courses positively, while The New York Times article focuses on the students and portrays online courses negatively. Even though The New York Times does not deny that some online courses may be successful, their article does bring about an important concern regarding certain students. I believe that each of these articles convey ideas that need to be equally examined. It appears to be true that there are many benefits to online education, and that many of these courses can be effective. However, with such great size, it is easy to overlook the students themselves. For any school offering an online class, I think it is crucial for them not to see students as numbers, but rather as individuals. This appears to be a difficult, if not impossible task. To benefit potential “borderline” students such as those expressed in The New York Times article, perhaps students should have to meet certain requirements before taking an online class in order to guarantee a higher success rate. In the end, there is still much to be discussed and thought about regarding this new and controversial subject. I am looking forward to reading more articles about these online courses, and using my student perspective to sort though them. Standing on the ground at the battlefields of Gettysburg is both a breathtaking, yet unsatisfying experience. Realizing that your feet are touching the same ground as men who died for a heroic cause brings humility, perspective, and a strong connection with history that cannot be experienced in an ordinary classroom. However, there remains a sense of disconnect from the souls of people, which site-seeing itself cannot satisfy. This missing connection, perhaps, is one that can only be attained through the careful teaching of stories that invoke that which will unite humanity for all time: emotion. When placed in its proper context, emotional stories not only bridge the gap between past and present, but also provide a better understanding for the events themselves. With the powerful combination of primary sources and modern technology, teachers are able to use these types of stories today more effectively than ever before from their own classrooms. As a summer intern for Professor Pinsker at Dickinson College, I had the privilege to travel with him to Gettysburg as he led a group of high school teachers from Oklahoma on a tour of the battlegrounds. Before the trip, he asked me to be thinking about a story that I believe is especially impactful, and how I would use it to teach high school students about history and the Civil War. After some of the more well-known sites, we eventually stopped at a fire station on Stratton Street. It was here that I first heard the story of Amos Humiston, a soldier who died on that very ground almost 150 years ago, with a photo of his three children clutched in his hand. Humiston’s emotional story immediately interested me, and after talking with several of the high school teachers there about the needs and struggles of their students to understand history, I realized that Amos Humiston could potentially fill the gap. 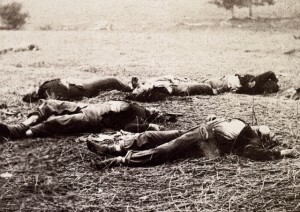 A little known story from the Battle of Gettysburg, his is one that nonetheless can be used to capture both the context of the times and heart of a soldier, while also providing opportunites for students to take a historians approach to the past. To gain initial background and perspective, students should become familiar with a textbook explanation of the Battle of Gettysburg. To add interest and depth, media sites such as Google Earth show fantastic views of the landscape, and maps or pictures from sites like House Divided show the military strategy and devastation of the battle. 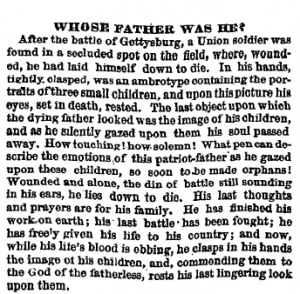 Once students have grasped an overall understanding of the Gettysburg Campaign, provide the students with a copy of an article from the October 19, 1863 Philadelphia Inquirer titled “Whose Father Was He?” Have the students analyze the document, and write down what they think it tells them about the war, family, and religion at the time. For more background and better analysis, the students could also read several paragraphs on pages 6 & 7 from Drew Gilpin Faust’s book titled The Republic of Suffering. In it, she explains the meaning and importance of “The Good Death” during the Civil War, describing how soldiers sought to be at peace with God and die honorably. Once the students complete this task, go on to identify the unknown soldier from the Philadelphia Inquirer as Amos Humiston, and explain his story. A detailed version of the story can by found in a five-part blog post by Errol Morris for the New York Times titled “Whose Father Was He.” In addition, a shortened handout version along with a brief video can be found on the Day 1 Gettysburg Virtual Tour for the House Divided website. Use photos of he and his children as visual aids, and provide the students with examples of his letters and poems. In addition, students could even write thier own poem or letter to thier family as if they were a soldier at the time. These devices and techniques are very helpful in getting students to empathize with people from the past, and provide a strong connection to their emotions. 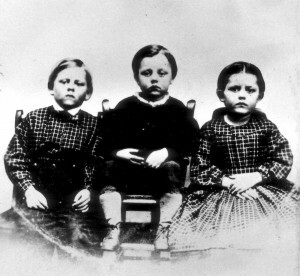 The ambrotype of Humiston’s children found with him when he died. After the students have gained an understanding of the context in which Amos Humiston lived and have identified with him emotionally, they must then begin to write as historians. Have them use everything they have learned thus far about Humiston from primary and secondary sources, and instruct them to write a brief memorial about him for the Gettysburg Battlefield. While brief, it will allow them to think critically about how to approach the past, and provide them with writing techniques that will be beneficial in future research papers. 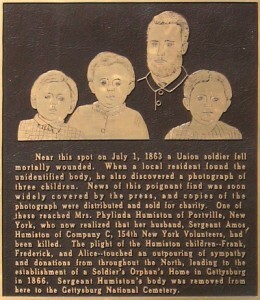 To conclude, a picture of the actual Gettysburg monument to Amos Humiston can be shown and read in class. Gettysburg monument to Amos Humiston. While there is no real substitute for a field trip to Gettysburg, modern technology has provided an opportunity for individuals to engage the past in significant ways. The high availability of primary and secondary sources over the internet allow teachers to present history to their students both accurately and creatively. Captivating stories such as Amos Humiston allow for the perfect combination of these sources and show students (if only a glimpse) of how real historians operate. The House Divided Project at Dickinson College and the Gilder Lehrman Institute of American History are doing something unprecedented. They are launching an open,online graduate course called “Understanding Lincoln” that will be taught by noted Lincoln scholar Matthew Pinsker in Summer / Fall 2013 and available for anybody who wants to learn more about Abraham Lincoln and his legacy during the the period leading up to the 150th anniversary of the Gettysburg Address. The limited enrollment graduate section of this unique online seminar which offers a full-semester graduate course credit (3.0 hours certified by transcript from Dickinson College) is designed especially for K-12 educators who want to learn innovative ways to teach Lincoln’s writings within the new Common Core state standards. Registration for graduate students ends on Friday, July 19, 2013 but space is limited and enrollment will close on a first-come, first served basis. The course tuition is $450. 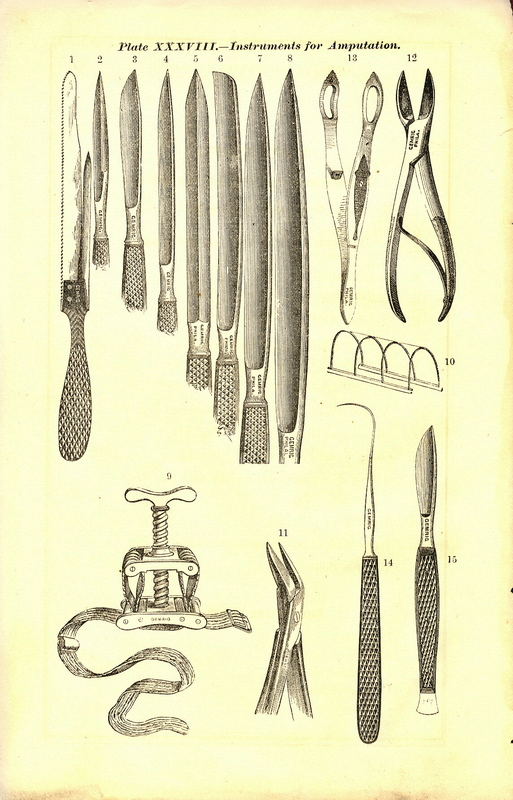 The open section of the course is entirely free, however, and offers any lifelong learners a chance to follow along with selected elements of the experience and to receive a Certificate of Completion from Dickinson College if they complete certain key components of the coursework. Graduate students in the limited enrollment section of the online course will also have a very special opportunity to participate in the events surrounding the 150th anniversary of the Gettysburg Address. On November 19, 2013, selected graduate students from “Understanding Lincoln” will be invited to attend the anniversary commemoration in Gettysburg, Pennsylvania at no cost –including free travel and accommodations. After the morning Dedication Day ceremonies, we will host a live-streaming webcast directly from the historic Wills House in Gettysburg where President Lincoln stayed during the night before he delivered his famous address. Partly through the extraordinary generosity of the Lincoln Leadership Institute, we will then be able to highlight the best multi-media final projects submitted by students in the course. These are the students who will be selected by Prof. Pinsker to attend the ceremonies and present their work in a live online session with fellow students and other interested course observers. If you’d like to see an example of how this online learning experience works in a history course, please check out this video segment on the Emancipation Proclamation, produced by Gilder Lehrman education coordinator Lance Warren and featuring Prof. Pinsker leading a short, close reading of the January 1, 1863 document. You might be surprised by what you don’t know about this famous executive order and how much can be gained by going through it almost line-by-line. Matthew Pinsker will be the main instructor for “Understanding Lincoln.” Pinsker holds the Brian Pohanka Chair for Civil War History at Dickinson College in Carlisle, Pennsylvania where he also directs the House Divided Project, an innovative effort to create free digital resources on the Civil War Era for K-12 classrooms. 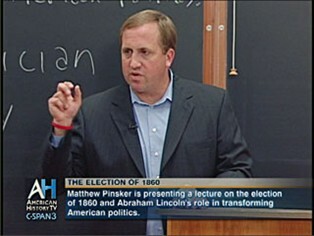 Pinsker is the author of various books and articles on Abraham Lincoln, including Lincoln’s Sanctuary (Oxford, 2003) and the forthcoming Boss Lincoln (W.W. Norton). Currently, Pinsker serves as a Visiting Research Professor at the Strategic Studies Institute of the US Army War College in Carlisle, Pennsylvania. He is also a Distinguished Lecturer with the Organization of American Historians (OAH) and a Bernard L. Schwartz Fellow at the New America Foundation in Washington, DC. Lance Warren will serve as the chief course producer. Warren is Director of Digital Projects for the Gilder Lehrman Institute of American History. He leads Gilder Lehrman’s online education programs and creates original video content for use in K-12 classrooms. His co-directed film, That World is Gone: Race and Displacement in a Southern Town, won the Audience Award for Short Documentary at the 2009 Virginia Film Festival. Warren received a B.A. in History and Political Science from Syracuse University and an M.A. in History from Brandeis University. Nobody would have appreciated the power of open online education more than Abraham Lincoln, one of the great self-made, lifelong learners in world history. This open online graduate history course aspires to create the kind of course that Lincoln would have appreciated. Just about 150 years ago, President Lincoln explained at Gettysburg how he believed that the Civil War would establish what he termed “a new birth of freedom” for the United States. During our sessions in 2013 (July 23-Nov. 19), Professor Matthew Pinsker will use this anniversary moment to share the latest historical insights about Lincoln as well as to introduce participants to a number of cutting-edge digital resources for the study and teaching of Lincoln’s legacy. The course will be organized around five popular designations that have been applied to the great president over the years (Railsplitter, Honest Abe, Father Abraham, Great Emancipator, and Savior of the Union) and will dig deeper into each of these themes in order to help explore their origins and assess their validity. In the process, participants will come to better understand Lincoln as man and president, and will also enjoy a unique online platform to share their own insights. Crowd-sourcing is a phrase used to describe how individuals can help develop online projects by contributing content to them remotely. Through the “Understanding Lincoln” course, we will attempt an experiment in what might be called “class-sourcing.” Participants in this course will have the opportunity to develop various types of content that will be published online as part of a forthcoming multi-media edition of Lincoln’s selected writings. 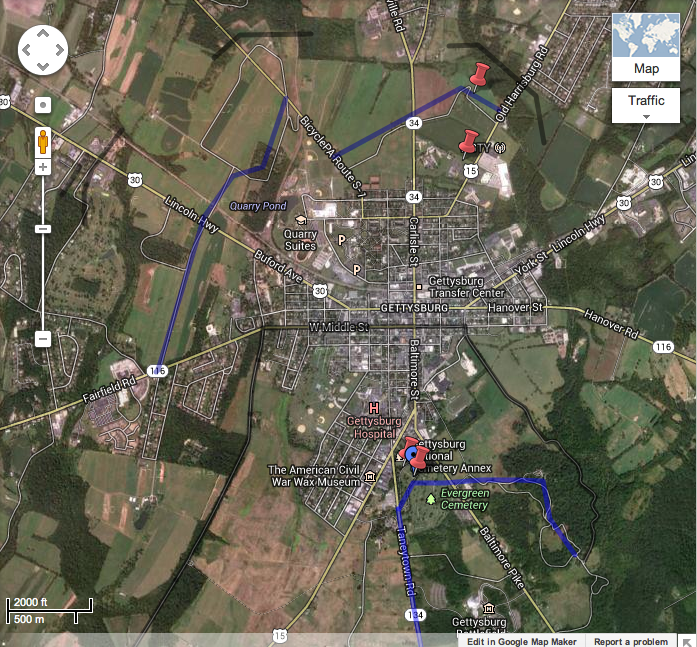 The very best work by course participants will then be featured during a Livestreaming field trip to Gettysburg on November 19, 2013 –the date which marks the 150th anniversary of the Gettysburg Address. We will webcast that day from the historic Wills House where Lincoln slept the night before delivering his famous remarks. Three seminar participants whose work has been judged the best in the course will then be invited to participate in the November 19 events at no cost to themselves –with travel and lodging costs paid for by the course sponsors. All readings for this course will be freely available online. Beyond intensive readings of Lincoln’s own letters, speeches and personal documents, participants will also have assigned essays and articles to read from leading historians such as David Blight, Michael Burlingame, Eric Foner, Mark Neely, James Oakes, and Sean Wilentz. Graded assignments for this course will include various types of online discussion and written participation as well as a series of short writing assignments, including blogging. The culmination of the course will involve the production of a major multi-media teaching project with an accompanying research paper that describes the project’s pedagogical intentions. The final multi-media projects will employ at least one of the digital tools introduced during the course utilized in a way that helps teach Lincoln’s legacy in a creative fashion by presenting various documents and writings from his contemporaries. In the excitement over the new “Lincoln” movie and Daniel Day-Lewis’s Oscar-winning and truly mesmerizing performance as Abraham Lincoln, it is easy to overlook one of the very best sources of information on Lincoln’s life –Lincoln himself. Abraham Lincoln never kept a diary or wrote a memoir, but he did craft a few, brief autobiographical sketches. The most important of these efforts came in December 1859 at the request of a Pennsylvania newspaper (Chester County Times) that was preparing a series on potential Republican nominees for president in 1860. 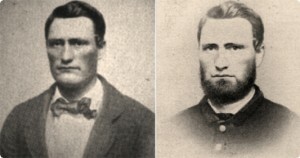 Joseph J. Lewis, publisher of the Chester Times asked a mutual friend, Bloomington, Illinois attorney (and Pennsylvania native) Jesse W. Fell, to approach Lincoln for information that could be used to craft a profile. What Lincoln produced was a 600-word document that reveals a striking amount about his background and style. 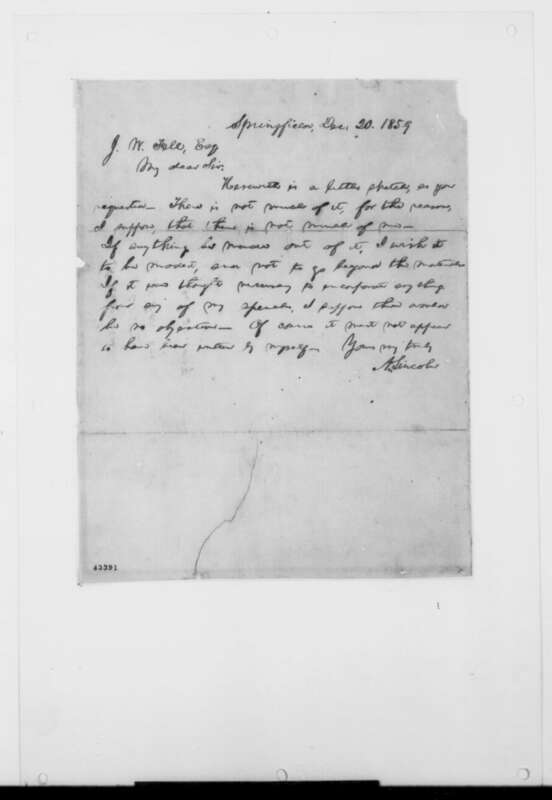 You can access a written transcript of the sketch (along with the equally revealing cover letter to Fell, where Honest Abe states confidentially, “Of course it must not appear to have been written by myself.”) along with a special audio version of the documents created for the House Divided Project by noted actor and Dickinson College theatre professor Todd Wronski. [NOTE: Just right-click on this audio link and select “Save Link As…” in order to download the audio file to your computer / network). continue reading "Teaching Lincoln’s Autobiography in the Common Core"
According to the “Lincoln” movie script, Friday, January 27, 1865 was an action-packed and pivotal day. It was the day of Thaddeus Stevens’s controlled performance in the House, declaring himself strictly for “equality before the law.” It was also the day marked by Abraham Lincoln’s bitter argument with his oldest son Robert and then his subsequent clash with his wife Mary after he finally decided to concede to Robert’s desire to join the Union army. 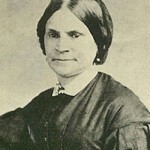 And it was in the evening of the 27th that both Mary Lincoln and later dressmaker Elizabeth Keckley urged the president to abandon his hidden-hand approach and provide more decisive leadership in the fight for the antislavery amendment. All of those “events” are fictional, but they are essential for understanding the film’s point-of-view –namely, that Lincoln interjected himself at the end of the battle for the constitutional amendment in a way that proved decisive. All of these scenes are entirely fictional (see previous posts here for details on Stevens and here for details on the Lincoln family), but that memorable quotation from Lincoln actually has its roots in a real primary source. Rep. John B. Alley (R, MA) claimed more than twenty years after the fact that he had heard from some unnamed person during the battle for the amendment that at some point the president had called into his office two congressmen in order to tell them that only two more votes were needed for passage and that they “must be procured.” Then Alley’s recollection provided a lengthy verbatim quotation (86 words) which he attributed to Lincoln that culminated with the ringing phrase, “I am President of the United States, clothed with immense power” (note that the script silently changes “clothed with” to “clothed in” –a more fitting usage). The problem is that this quotation is almost completely useless as historical testimony. Alley was recalling events from two decades past that he had apparently heard about second- or third-hand. There are no names, no dates, and the only specific detail –two votes short of the required two-thirds super-majority– seems suspiciously like the final vote tally (two more than needed). Regardless, nobody can be trusted to remember verbatim quotations of such length. Yet Doris Kearns Goodwin quotes the entire passage in her book, Team of Rivals (p. 687) and it appears it was from this account that Kushner got the raw material for his script, which he then embroidered by placing at the very end of the lobbying effort and in a meeting with several of the movie’s principal characters, not simply two unnamed congressmen. The filmmakers present this exchange in the most dramatic fashion possible, having Democratic leader Fernando Wood (D, NY) first disrupt the proceedings, allegedly waving “affidavits from loyal citizens” confirming the existence of secret peace talks. This creates chaos on the floor of the House that leads a fictional “conservative” Republican named Aaron Haddam to indicate (after receiving a critical nod from Preston Blair, perched in the gallery) that the “conservative faction of border and western Republicans” could not support an amendment “if a peace offer is being held hostage to its success.” Then there is a mad footrace from the Capitol to the White House, involving Lincoln’s aides and the Seward lobbyists. 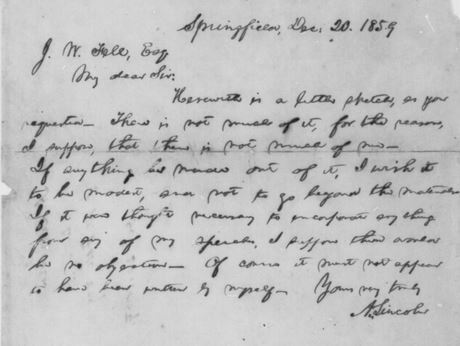 John Hay, the president’s young assistant private secretary, heatedly warns him against “making false representation” but Lincoln crafts his reply (technically true but obviously deceptive –since the commissioners were on their way to Hampton Roads, VA) and hands the note to seasoned lobbyist William N. Bilbo (James Spader). Bilbo then delivers it to Rep. Ashley who reads it with a flourish to the entire House. There is no record of any of this in the official proceedings. Nor does Ashley claim in his recollection that he read the note from the president on the House floor. Instead, it seems he may have simply showed it to some key figures. Bilbo was not even in Washington at the time (see previous post here). There was almost certainly no footrace. And no contemporary or historical account has Preston Blair in the gallery giving directions to conservative congressmen. Aaron Haddam is a fictional character, listed as a Republican from Kentucky, with no obvious historical counterpart. 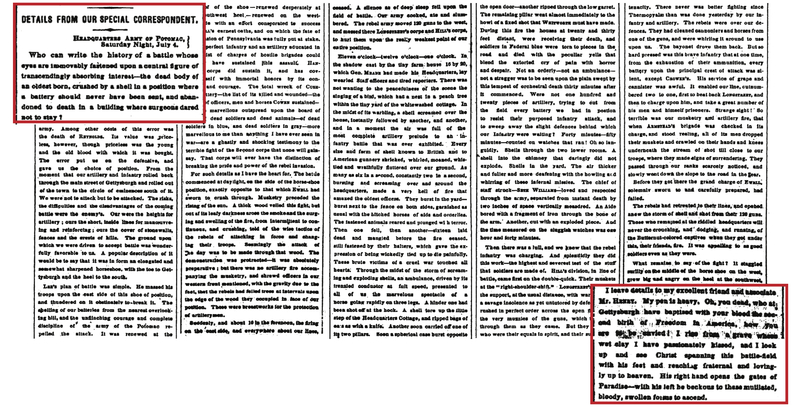 All of these details are included in the film for dramatic effect but without any real documentation –beyond the notes which Ashley claimed to have in his possession but which are not apparently available in their original forms, and his recollection of the episode, which most historians have accepted as credible. Then there is the matter of the roll call. It was an unusual affair. The House galleries were crowded, anticipation was high and the celebration afterward was unprecedented. Newspapers and magazines all took note of the revolutionary nature of the moment. Even the Congressional Globe invested this particular roll call with special drama, recording as it rarely did, outbursts of “considerable applause” when certain lame duck Democratic members, such as Rep. James English (D, CT), voted “ay” for the amendment. This has particular meaning in today’s context since there has erupted a small degree of controversy about Connecticut’s votes in 1865. 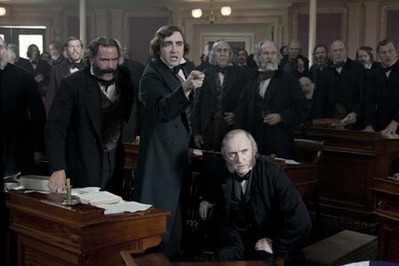 In the “Lincoln” movie version of the roll call, two fictional congressmen from Connecticut cast the very first votes on the amendment –both nays. Yet in reality, the roll call proceeded in alphabetical order by congressman (not by state) and the entire four-man Connecticut delegation actually voted in favor of abolition (because of English’s critical switch). This second fact helped convince modern-day Connecticut congressman Joe Courtney (D, CT) to demand an apology from Steven Spielberg in early 2013 and to request a promise for a correction to the DVD edition of the movie. Scriptwriter Tony Kushner quickly dismissed the request and the affair struck many as a publicity stunt, but New York Times columnist Maureen Dowd then sided with the congressman with an op-ed provocatively headlined, “The Oscar for Best Fabrication.” What Dreamworks might do in the DVD that it promises to make freely available to every middle and high school in America remains to be seen. Courtney was not the only figure upset by the filmmakers’ decisions regarding the roll call. The script altered dozens of names of representatives in the 38th Congress, some for obscure reasons. The filmed version of the final vote, for example, is full of fictitious names and invented dialogue. One of these characters –Walter H. Washburn of an unidentified state– casts a vote against the amendment. The problem is that there were two Washburns in the 38th Congress –a William Washburn and Elihu Washburne –both Republicans who voted eagerly in favor of the amendment. And naturally, their descendants are now disturbed by the implications of the movie and also want changes or corrections. Most academic historians are less concerned about the name changes (although they seem strangely unnecessary) and have been more fixated on other minor differences from historical reality. There is the problem of the voting by state (which is a convention of political movies but not the historical Congress). Then the movie has figures in the gallery who were almost surely not there –such as Mary Lincoln and Preston Blair– but omits identifying figures we know to have been present, such as Frederick Douglass’s son, Charles, who wrote a touching letter afterward about the experience to his father. 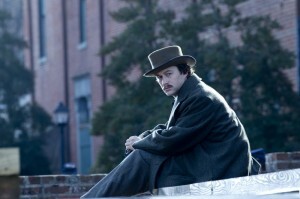 The film also attempts to enhance the suspense of the moment by cutting away to places such as Grant’s headquarters at City Point, Virginia, where there is depicted a telegraph reporting in real time about the voting –something that did not actually happen. And finally, there is the curious decision to have Thaddeus Stevens (Tommy Lee Jones) take the official copy of the amendment from Edward McPherson, the House clerk, claiming that he will “return it in the morning. Creased but unharmed.” One suspects that scriptwriter Tony Kushner must have some kind of source for that unique story –but if so, it is not yet apparent. Did Abraham Lincoln Really Slap His Son? No single film could ever hope to capture the range of historical interpretations that have been offered to explain the complicated Lincoln family dynamics. Some historians consider the marriage between Abraham and Mary Lincoln to have been “a fountain of misery.” Others see longstanding affection and partnership. 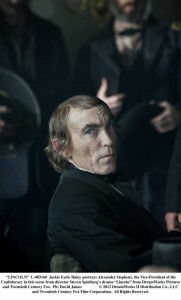 Some find Lincoln to have been essentially an absentee father. Others extol his sensitive parenting toward very different sons. And these debates have proven especially difficult to resolve because the evidence is so thin. Hardly any of the family correspondence remains. None of the family members kept diaries. Almost all of our information about their relationship derives from second- or third-hand accounts, usually recollected after the war. Yet this deficit of evidence also provides “Lincoln” scriptwriter Tony Kushner, director Steven Spielberg and actors such as Daniel Day-Lewis and Sally Field with freedom to offer their own interpretations. They can imagine private moments where historians are otherwise forced to remain silent or least circumspect. 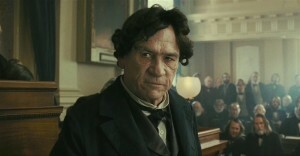 Two good examples of this occur in the film during Scenes 29 and 30 where President Lincoln engages in loud, back-to-back arguments with his oldest son Robert (Joseph Gordon-Levitt) and then with his wife Mary. In one episode outside a temporary wartime hospital, the president actually slaps his son in anger. This is wholly invented. There is no source for this scene, and it seems entirely implausible to most Lincoln historians, not only because both Lincolns were almost notorious as parents for not disciplining their children, but also because Robert had a reputation for being so outwardly respectful toward his parents. 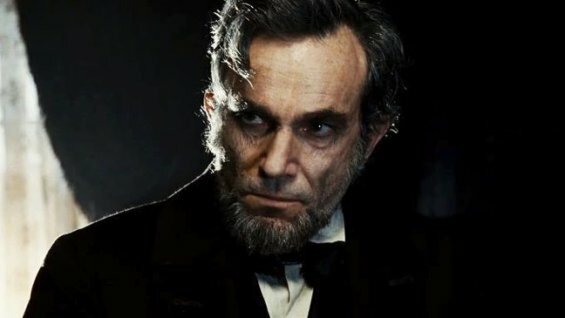 It seems almost impossible to believe that eldest Lincoln son would have told his father, as he does in the movie, “It’s mama you’re scared of, not me getting killed” and that his father would have then lost control and slapped him in public. And yet … it could have happened. There were tensions between father and son, and there was a quiet debate over whether or not Robert should join the Union army. Nonetheless, this is a risky use of artistic license disconnected from any serious evidence. The second major argument depicted in the movie is more plausible, but also wholly invented. The script has Mary Lincoln telling her husband that “you’ve always blamed Robert for being born, for trapping you in a marriage that’s only ever given you grief and caused you regret!” The line implies that the Lincoln’s had a shotgun wedding of some sort, but Robert was born almost exactly nine months after their wedding day in the early 1840s. Nor is there any contemporary evidence that Mary Lincoln refused to console their youngest son Tad after his older brother Willie died, or that the president ever threatened her that “for everybody’s goddamned sake, I should have clapped you in the madhouse!” Some of that information (about the “madhouse”) derives from Elizabeth Keckley’s recollected accounts about Mary’s grief in 1862, but most of the vitriol in this exchange is imagined –again, possibly real but certainly not proven by any reliable record.